Packaging your shipment correctly is crucial to making sure your inventory reaches us safely and that it's optimized for entry into our fulfillment centers. The following requirements apply to all boxes shipped to Amazon fulfillment centers whether by small parcel delivery, less than truckload (LTL), or full truckload (FTL) shipping. Providing box content information improves the management of your inventory within Amazon and helps your products become available for sale more quickly. For more information, see Provide box content information. Each box contains inventory from only one shipment ID. Do not combine items from multiple shipments in the same box. You can find the shipment ID on the Summary page for that shipment. Use a rigid, six-sided box with flaps intact. Each box you include in the shipment must have its own unique FBA shipment label printed from your Shipping Queue. Each pallet requires four labels, one on the top center of each side. Each box on the pallet also requires its own label. When shipping multiple case packs in a master carton, apply the unique shipping label on the master carton. If you are reusing boxes, remove all old shipping labels or markings. Cover existing barcodes with opaque tape or use a black felt-tip marker to render the barcode unscannable. This prevents the incorrect barcode from being accidentally scanned during the receiving process. Use 2 inches of cushioning between each of your items and the inside of the box. After you pack your box, shake it gently. The contents should not move when shaken. 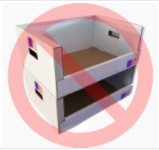 Using boxes with dimensions measuring at least 6 x 4 x 1 inches and weighing at least 1 lb (but no more than 25 inches on any side and under 50 lb total) can reduce delays in receiving. Do not use pallet-sized boxes (also known as "gaylords"). Don’t use string, straps, or over-wrap (plastic or paper). Do not bundle multiple boxes together. Picking the right-sized box for what you are shipping is important. If the container is too large, you will need to fill it up with enough packaging material so that the box will not collapse if heavier boxes are stacked on top during shipping. Tip: For best results, use a new, single-wall, corrugated shipping container with a high burst- or crush- strength stamp. Use a minimum of 2 inches of appropriate packing material around each item and the same amount in between your products and the walls of the box. If your items are being shipped in the manufacturer's case pack, the 2 inches of packing material is not necessary. Boxes containing multiple standard-size items must not exceed 25 inches on any side. A box may exceed the 25 inch limit if it contains oversize units that measure longer than 25 inches. Boxes that are excessively large relative to the oversize units may be subject to restriction of shipping privileges, additional fees, or refusal at a fulfillment center. Important: Carton dimension policies are strictly enforced. Sending oversize cartons to the fulfillment center may lead to blocking of future shipments. Boxes containing jewelry or watches must not exceed 40 lb. Important: Carton weight policies are strictly enforced. Sending overweight cartons to the fulfillment center may lead to blocking of future shipments. Using appropriate packing material ensures your shipment quickly moves through the fulfillment center receiving process and protects our associates from potential safety issues. Tip: After you pack your box, shake it gently. The contents should not move when shaken. Bubble Wrap or small cell bubble sheeting provides surface protection as well as shock absorption. It can also be wrapped around almost any product, regardless of shape or size. Paper, specifically kraft paper intended for packing applications, can be used to fill empty space in your shipping box. For best results, use kraft paper with a minimum basis weight of 60 lb to ensure that it is thick enough to provide protection. Inflatable air pillows use air pressure to secure and hold products in place inside the shipping container, and provide an air barrier of cushioning. They generally come in a strip of air pillows that you can easily use as lightweight dunnage to fill the empty space in your box. Warning: Inflatable air pillows can lose pressure in low-temperature and high-altitude environments. Polyethylene foam sheeting is thin, soft, resilient, and provides surface protection and cushioning properties. This type of packaging is good for protecting lightweight items. All products require a scannable barcode. For more information, see FBA product barcode requirements. Each box in a shipment requires an Amazon shipment label in addition to the carrier label. For more information, see Shipment label requirements. In addition, boxes and box contents must be packaged in such a way that the contents arrive safely and intact at the fulfillment center. For more information, see Packaging and prep requirements. Some common issues that may result in the refusal of inventory at the fulfillment center include shipments that are larger than expected, damaged, or sent to the wrong fulfillment center. Such shipments may be rejected at the dock and returned to you at your expense. Merchant Damage refers to any inventory that is delivered to an Amazon fulfillment center in an unsellable condition. Shipments considered Merchant Damage or Defective incur a return freight charge. You cannot refuse or return shipments that are returned to you without first contacting Amazon. Shipments that you refuse or return without first contacting Amazon may be refused a second time, and any costs incurred will be at your expense. Make sure your distributor has the correct Amazon shipment labels for your shipment. You can grant limited access to your seller account to access labels. For more information, see Set user permissions. In addition, your distributor must adhere to all Amazon shipment requirements.